Direct from Duh’s Orchids, this large-flowered Cattleya is a result of mature divisions, not a mass mericlone of a mericlone, assuring you of the very best ! These are handsome mature divisions of 3-5 pseudobulbs, bearing huge flowers reaching 19.5cm in size, an amazing size for B. digbyana breeding. 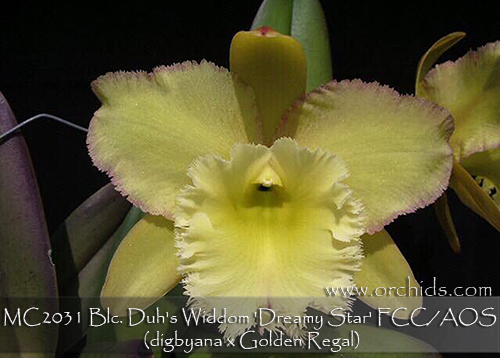 When awarded in Taiwan it carried two regal canary yellow heavy substance flowers on one inflorescence, its impressive lip heavily fringed and presenting exceptional form for this line of breeding. And its citron fragrance is amazing. These divisions are growing in moss and our stock is limited. Very Highly Recommended !